Dr. Herro has practiced Anesthesiology in The Valley for over 30 years. He is the former Chief of Trauma Anesthesia at St. Joseph's Hospital, and former Chief of Anesthesiology at Baptist Hospital. He is Board Certified in Pain Management. Additionally, he has been providing ECT anesthesia to patients with Treatment Resistant Depression (TRD) in various settings over the same time period. Dr. Herro and I have been providing ECT to TRD patients together for over a decade. This relationship enhances the coordination of your care. 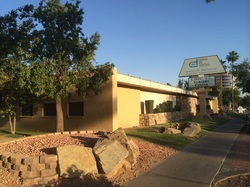 Dr. Herro's Medical Center has been serving The Valley since 1985. HMC is a fully staffed Outpatient Medical/Surgical Center with a complement of personnel experienced in Anesthesia. Herro Medical Center is conveniently located at Central Avenue & Camelback Road.